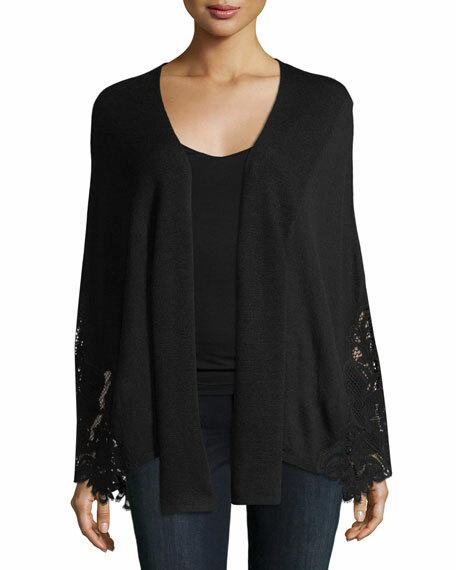 Kobi Halperin "Benita" lace-trimmed extrafine merino wool cardigan sweater. kate spade new york turtleneck sweater. Turtleneck. Long sleeves. Relaxed silhouette. Front patch pockets. Wide banded hem. Below-hip length. Pullover style. Nylon/wool. Dry clean. Imported. Model's measurements: Height 5'10"/177cm, bust 33"/84cm, waist 25.6"/65.2cm, hips 35.8"/91cm, dress size US 2-4/FR 34-36. Kobi Halperin "Melita" sweater in diamond pointelle knit with sequined stripes. Boat neckline. Long sleeves. Pullover style. Fine merino wool. Kobi Halperin "Melita" sweater in diamond pointelle knit with sequined stripes. Boat neckline. Long sleeves. Pullover style. Fine merino wool. Dry clean. Imported. Model's measurements: Height 5'10"/177cm, bust 31"/79cm, waist 24"/61cm, hips 34"/86cm, dress size US 0/2. Lisa Todd "Zipline" lightweight sweater with side zipper detail. Approx. length: 24"L from shoulder to hem; 24"L down center back.